Can stock market investors take some smart cues from Holi celebrations? Actually yes! There are 5 very interesting lessons that stem from the festival of colours. As we welcome the festival of Holi, it brings with it the kaleidoscopic brilliance of colours and the indulgent memories of childhood. Holi has many facets to it. The Bhang reminds us to accept the good things in small doses. But above all, the Holika Dahan represents the victory of good over evil. Can stock market investors take some smart cues from Holi celebrations? Actually yes! There are 5 very interesting lessons that stem from the festival of colours. Have you ever imagined how the festival of Holi would look without the multitude of colours dotting the celebrations? It would be totally insipid. The colours of Holi represent diversity. From your investment perspective, it is all about adding diversification and variety to your investments. A single point approach can be too risky. Add colour to your portfolio and bring life into your investments. Most Hindu festivals embody the victory of good over evil and the Holika Dahan represents the burning of the evil Holika who tries to get Prahalad consumed by the flames. Did you know that we all have the Holika in our investment portfolios? They could be the laggards or the underperformers or the villain stocks. They consume capital but don’t give returns. It is the time for ejecting such Holika from your investment portfolio and infuses fresh ideas. Legend has it that King Hiranyakashyapu was so powerful that he was almost invincible. The probability of any human killing him was next to nothing. Lord Vishnu assumes the form of Narasimha and manages to kill Hiranyakashyapu in mid air by taking form of half-man and half-lion. The Narasimha Avatara represents the Black Swan event that all our investment ideas are exposed to. Quite often, we are not able to comprehend the risk that our investments are exposed to. This festival is intended to touch our chords of humility and remind us that the best of investments can also be fallible. Prahalad represents a variety of virtues. He is devout, he is diligent and his conviction in the Lord is unflinching. For investors, Prahalad gives us the all important lesson of conviction. More often than not, we fail to make profits in the market because our convictions tend to falter. That is what we need to be cautious about as investors. Making your investments grow is all about conviction and like Prahalad we just cannot let it falter. That is an important reminder on the occasion of Holi. When colour filled balloons are thrown at people, the normal refrain is “Bura na mano Holi hai”. The message is that the festival is meant for fun and not to hurt anybody. It is an invitation to fun as well as an apology in advance. For investors, this has two implications. 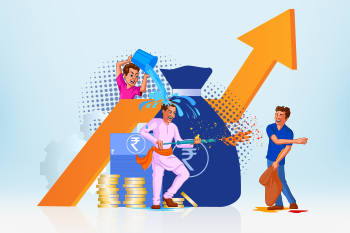 Firstly, like in Holi, we need to play our investments safe and not expose your portfolio to too much risk. Secondly, the whole idea of investing is to hope for a brighter tomorrow and also live to fight another day. It is this hope and optimism that the festival of colours instils in every investor.